Now that the original course is out of beta we are able to start work on a revised course. We're looking for suggestions of things that could be improved and things that could be added. At the moment one idea is to add the remainder of the Welsh for Adults Intermediate course which would take the content to level B1 on the CEFR. Otherwise we would be grateful for suggestions, especially about individual units. It's a while since I completed the course, so apologies if any of my suggestions below are already included in the course and I have just forgotten about them. I agree with Adams861 that full sentences are much better that single word exercises. I also agree with others who have said previously that they would prefer the Welsh town names skill to be moved to later in the course (or maybe made a bonus skill rather than a compulsory skill). I have seen quite a few people tweeting about the sentences about a dragon, I think it would be popular if you added a few more weird sentences about dragons throughout the course. With regards to vocabulary, since plurals in Welsh are so irregular I think it would be good if you could add all the plurals of words which are already included in the course in their singular form (and vice versa). It would be nice to see some extra vocab in "The Arts" skill (eg. orchestra, choir, ballet). A skill for discussing TV programmes, including vocab such as soap opera and documentary would also be good. This might also be a good place to add more vocab for giving opinions eg. casau, dwlu etc. I am finding it quite difficult to remember when to use yw/ydy, when to use mae and when to use sy with question words. I think a new skill with lessons covering each of the question forms shown here http://ssiw.pbworks.com/w/page/44701949/Ydy(yw),%20mae%20or%20sy would be really helpful. I know that these question forms are already taught in the course but if they could be grouped together in one skill, maybe as revision, I think it would help me to learn which to use in which situation. I also find it difficult to remember all the different constructions which are used to say "that" in Welsh. A skill which covered all the conjunctions shown on the right here http://pbs.twimg.com/media/CkBXrgRXIAAYa4B.jpg would be great. Although most, if not all, of these conjunctions are already taught in the course I think an extra skill covering them all together would be really helpful (this could be revision, I realise that it might put people off if they were all initially taught in a single skill). If you had one lesson covering each type of "that" conjunction, then when we came to strengthen the skill we would get good practise choosing which to use in which circumstances. Thank you for committing to continue improving the course. For one, a seperate unit about questions maybe, to systematically introduce the question markers like ydy/oes etc.? Plurals! Towards the end of the course there was a point where I felt suddenly bombarded with random plurals without much context. Perhaps you could group together words that form plurals in a vaguely similar way in specific plurals skills? Anything to make them easier to remember. The course is wonderfully structured to reinforce grammatical patterns, but I found plurals a weak point, and being able to pluralise things is a pretty important skill. Overall, though, I thought the course was marvellous; it both felt quite painless to proceed through and absorb and and is full of very practical sentences. Whatever you're doing, keep doing it! We're looking at plurals, we're hoping to ensure all new words are defined with their accompanying plurals so that sentences with plurals can be used in conjunction with sentences with singular nouns. I would like to see more exercises where we have to translate from English to Welsh. We are not aware that this can be controlled by the course teams - it seems to be set somewhere with Duo's internal algorithms. I have noticed a relatively lower proportion of English to French, for example, while brushing up my rusty French recently. It seems like they monkey around with the proportions from time to time and have gotten rid of a lot of the stuff where you have to write things in on your own. Which is a real shame, since it's one of the best ways (for me, at least) to remember the words. I would guess that they are trying to cut down on the server load, but even if it were just single words it would be helpful. I've used Duolingo intermittently for a couple years and I remember having more stuff to type in in the past... and what a pain in the tuchus it was because it's slower and involves typing, but now that it's been downplayed I miss it for language retention. I write out everything I learn in the courses. I have spiral notebooks full of every course. I am like you, the retention seems better when I am forced to type, write it out. You could teach the 5 languages I am learning from the handwritten sheets for each course that I have. LOL I write it out on paper, then type the answer in. I agree, I think I get asked to translate from Welsh into English far more than the other way around and it is easier for me to recognise the Welsh rather than to remember the Welsh so I'd like a lot more opportunities to practice that. I'm fairly sure there are some things I've never been asked to translate at all. For one thing, I've not once been asked to translate, from either language, "July" so that's one word I'll have to remember by myself! i just wonde if it is possible to make dewi lingo dl ceri lingo cl and eleri lingo el to save typing? I have been marked wrong due to typos in names which is evidence of my arthritis not my Welsh! Wow! Adding the intermediate course material would be amazing! Haven't done much of the course yet but 2 things struck me. There was a lot of nouns quite early on which didn't feel like basic vocabulary, with all the clothes (belt, underskirt) and the animals (turtle, butterfly). I think these could move later for when you've got more of a feel for the language. The "Dialects" section needs more explaining and seemed buggy. I guess the point was to offer "boy", "woman" in South / North Welsh but it didn't say which was which and seemed to offer me the same translation several times in succession. The dialect skill does need work. I found it a bit confusing having so many words for man and woman and boy and girl without knowing why (as I use the app I had no notes). Overall I thought the course was very well-made, especially since I finished it while it was still in beta. As far as pacing, skill length, skill positioning, etc. goes, I can't think of anything I'd want to change. However, skills (or extra sentences) focusing on plurals would be pretty much essential, as most of the words in the course (as far as I can remember) are only shown in either the singular or the plural, and I don't remember there being any guidelines given on how to form plurals. As mentioned by others, adding more sentences/getting rid of single-word sentences is a must. Also, I'd love it if there was a skill (or two) focusing on dych chi vs rydych chi, dych chi ddim vs dydych chi ddim, dych chi vs ydych chi, etc. I "learned" the rydych chi/dydych chi/ydych chi forms in school so seeing one form for the affirmative/negative/interrogative completely threw me. And I don't know if this is an issue you guys can fix, or if it's just a Duo thing, but whenever I type "ydych chi" as part of an answer, it gets marked as "almost correct" and there's no option available to send in an error report to suggest it as an alternate answer. But honestly, I was very pleasantly surprised by this course, you all did a great job and I'm looking forward to seeing how you'll further improve. I very much agree about the place names. This will be important if I'm ever able to go to Wales, but as an American I don't know most of those places in English, and learning the Welsh words for them doesn't seem a good use of my time when I could be learning something more useful - or more interesting. Today I was trying to do a practice exercise and I kept getting place names. Let that be an extra or an optional unit! I would like to thank you all for the course it has really made a difference to the speed that I am learning Welsh. Please keep it up! I would like to see a unit on common colloquialisms that are really confusing when you first hear them. 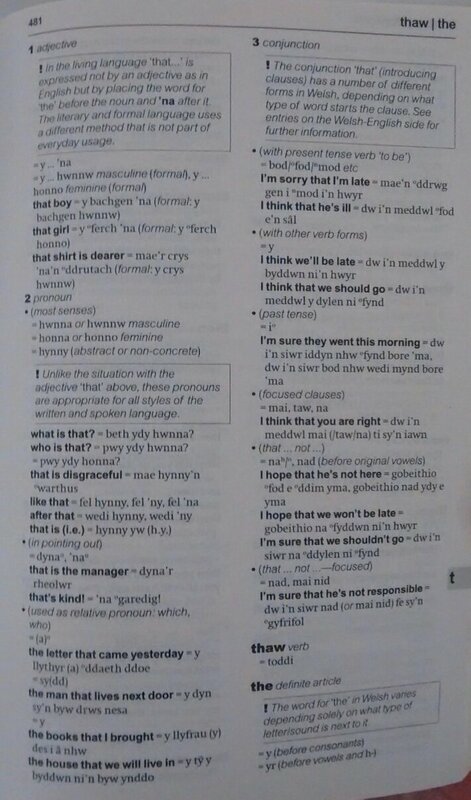 Examples that I have come across include "ti'mod", "chi'mod", "'sgwenni", "'sgwni" and "tel". A unit on common idioms would also be good eg "ar y cyfan", "siwr yn fod" etc . I'd also like to see units with more complex sentences using bod, taw, y, nad as conjunctions. Finally, a unit on answering yes and no in different circumstances would be great. Spot-on Malwen and big ups for the contribution. I have one more suggestion for the Opinions section. The ...'Dw i'n meddwl bod sentence starter is great when trying to speak with fellow learners. It would be nice if you could add the following to your unit(s). Dw i'n meddwl y bydd.../y dylai.../taw'r.... Use of bod and taw is tricky for me, and I would appreciate some Duo practice on this if possible. I'm really looking forward to Tree 2. Diolch I chi am wneud hyn yn bosib. Thanks these are very useful suggestions. This is very good news. I would like to see less one word questions - vocabulary - and instead embed/introduce these words into longer sentences. How about a unit on conversation/discussion points. Memorize has an 'opinions and discussion points,' the basis of which could make a great Duo unit. Also the Memrise 'Welsh ❤❤❤❤❤ Traps' units would translate well into a Duo unit. Diolch yn fawr. I agree that fewer one-word questions would be good. I think it's easier to learn vocabulary when it's integrated into sentences. This may be a little premature to ask but is this new and revised content to be added to the end of the tree in the form of new units or embedded within the existing tree? If embedded, will students have to start the tree again to experience all the revisions or will one be automatically exposed - if you have finished the tree - via strengthening? There will be new vocab and patterns added at the end of the current course to take it to a higher level. We also need to revise and re-order some of the existing content in order to eliminate a few errors and several ambiguities, and to improve things which people have found hard, or too easy, to get to grips with. We will be in touch with other teams to see how these things can affect existing learners and how best to address any potential problems. any incomplete sentences too. For example, the colour unit is rather dull: red train, white cat, grey day, pink bike... If they were in sentences it'd be much less boring and better for learning. I'd rather they had none instead of fewer one word questions. I only occasionally want to just go over words in isolation and when I do I'd rather use Memrise. I think I am too good at getting meaning from context. I need some one word exercises. There's a Memrise unit that contains all the Duo Welsh vocabulary if that is what you are after? That's a very good argument for having more English-into-Welsh questions, Duolingo... I think that's also why Duolingo likes the silly sentences where context isn't as helpful. I don't mind understanding from context occasionally as it still helps the word get into my brain to an extent but it's certainly not the only way I want to learn but I'd rather I could do single words separately and not within exercises where they feel like clutter to me. I don't know how exactly it could be included, but I would appreciate some sort of content regarding the gender of nouns. I don't know if I've missed it, but I think it's never even addressed that nouns even have genders, even though it affects the mutation. Oh, and regarding the mutation, it somehow irked me sometimes that when you have to translate just one word, you sometimes need to fill in a mutated form, not the dictionary form. You know what I mean? Sometimes it asks you to translate "to think" and it tells you that the correct form is "feddwl". Or the other way round, it asks you to translate "fod", or whatever. I think, it would be more consistent if the course would only use the dictionary forms in those cases. Just my two cents :) I appreciate your work, thanks for continuing to improve this already great course! We have already removed all(?) of the premutated words from the course though annoyingly many still appear due to the "Duolingo Zombie" glitch that has yet to be fixed. I agree about the genders, they could do it similarly to how the German course does it, where you get prompted for a noun and you first have to select "der", "die" or "das". In Welsh they could stick to nouns with determinate articles and have the user pick the "y" or "yr" and then select the or type the noun with the proper mutation. Also would like a vocabulary section like in the German course: https://www.duolingo.com/words But hopefully with gender and number added to the table and perhaps some advanced filtering so we can focus on nouns and go make some flashcards! Cadair, cadair goch - A chair, a red chair. Syniad, syniad da. Geirfa, geirfa dda. - An idea, a good idea (masc.). A vocabulary, a good vocabulary (fem.). Another unit on dialects could probably cover some S/SW dialect expressions such as sa/smo/sana i'n... etc. And perhaps a bonus section on some common spoken contractions (provided that the course voice can handle them)? Pobol y Cwm has characters from all over Wales, so you hear all sorts of dialects and slang in it - they seem not to try and adopt language from one particular area. One character even came from Patagonia in support of some sub-plot or other. A good video or podcast covering the major dialectal differences would probably be usefull, if anybody knows of any they could link. I'm not sure how well Duolingo could teach so many variants for the same thing though. Could question words be introduced sooner? I'm glad that the dialects skill will be looked at. My other suggestion isn't a very important one but could more checkpoints be added? It doesn't look right that the third and final checkpoint happens so early in the course. I've seen other courses on here with six checkpoints so it should be doable. A big thanks to the contributors! The Welsh course on here is really good and I'm looking forward to new skills! I am thinking about the Want units. I seem to remember eisiau being used and wondered if inclusion/discussion of moyn/ymofyn/chwant/angen/rhaid would be useful to shed light on correct usage? I haven't understood why it's "Dw i eisiau" but "Dw i'n hoffi". Could that be explained somewhere? The reason is because "Hoffi" is a verb-noun whereas "Eisiau" is more a noun which we use with as a verb. Ibisc recently stated somewhere that in very formal registers of Welsh we say "Dw i ag eisiau..." which translates as "I am with a want" which makes it easier to see how it means "I want". (Note the form using "Ag" is extremely uncommon, to the point that I didn't even know it existed, so stick with just "Dw i eisiau". Good answer. Something along these lines would be good to include in the course. 1000000% seconding this. Yes, please! moyn is actually very simple. It is a contracted form of the verb-noun ymofyn. This has several meanings, but the common one with moyn is 'wanting, to want'. However, its use like this is common in only some of the Welsh dialects. But every Welsh speaker in Wales will know moyn won't they - some dialects only perhaps, but that includes carmarthenshire and all the first language speakers in Glamorgan, so I reckon that must be at least half the speakers in Wales that use moyn. I have a question about the new (chat) Bots feature which, although separate from the normal course tree, I think is just about 'on-topic' or at least related. This is aimed primarily at the course creators (@rmcode), but I suspect others would be interested in hearing about this. Firstly, for those who haven't encountered or heard about them, the Bots are a way of practicing coversation within Duolingo in the form of 'guided' chats/conversations. They have only recently been released for a limited range of devices, iPhone and (since a couple of days ago) iPads (much to the heated annoyance of Android device owners! ); and for a limited number of languages, currently only French, Spanish and German. I have tried these for French and although they are currently limited both in number (22 at time of writing) and have a few flaws and are slightly inflexible on occasion they are a great way of practicing conversations and are quite fun. Also there is no translation, so it's a bit more immersive and natural than the normal tree, and fills a gap in the current Duolingo course structure. The theory is that the Bots learn and improve from the responses people give. Have Duolingo made you aware or given you any information about these? If so, have they given any indication when they might be rolled out and made available to the Welsh course? From what I can glean from my usage, the conversations and basic responses would have to be contructed and entered entirely manually by native speakers - this is not something that could be automatically generated from the existing course/tree - therefore Duolingo would need to provide you with new tools for creating these. I'm assuming that French, Spanish and German were chosen first because these were the core language courses created by Duloingo themseives rather than by volunteers. If the original course the Welsh tree was based upon includes such conversations, you might have a ready supply of material. Although, obviously adding to your workload, I would imagine (guessing) that constructing conversations might possibly be more straightforward than the normal tree. From the French Bots at least, it appears new Bots can be released individually as-and-when, so they shouldn't interfere with the work on the V2 tree too greatly. So my main question, really, was whether Duolingo have even mentioned anything about the Bots to you? If not, you might not even be aware of them. So I thought it might be a useful excuse for engaging in a conversation with them and possibly getting a head-start. Actually; the thought occurs to me that since the Bots are based around specific characters (Bot people), they might be a great way of introducing dialectic variations. You could even repeat the same conversations with different characters from different areas/ages who might use different language. People can simply choose to ignore conversations they are not interested in, if they wish. There is a brief introduction to the concept of the Bots at: http://bots.duolingo.com and this discussion post: https://www.duolingo.com/comment/18155544 provides a little more explanation. Be warned however, the replies have now largely decended into low-quality whinging and conspiracy theories from the Android community, and nonsense posts! This may be just me, but I feel like many of the grammatical concepts that are vital to understanding the language were easy to miss, and could hinder future understanding. I say more focus on grammar, as vocabulary words can be learned anywhere, by grammar is needed to utilize them. Again, this may just be me; love the course. I completed the Welsh course today, and I have enjoyed it a lot! The lessons are well made, many different constructions are covered, and the grammar explanations are really good. There are a few things I would like to see more of in a revised course. Firstly, I would like to encounter more types of subordinate clauses and be drilled more in using subordinate clauses. In particular, I think it is important to have lessons on relative clauses, which are not really covered now. But I would also like to see more kinds of adverbial clauses and more on complement clauses to speech and thought verbs (especially when the verb of the complement clause is not "bod"). Secondly, as others have mentioned, the plural needs to be covered more thoroughly. It is a difficult subject in Welsh, but it is important to be able to figure out the plural form of common classes of nouns. Thirdly, different classes of nouns can often be identified by their endings ("-wr" for individuals doing some activity, "-aeth" for abstract nouns, "-o" for verbnouns etc.). It might be useful to have a lesson on that. Finally, Welsh has a quite fine-grained distinction of clause types: The standard sentence type with "mae" and "yn/wedi", existential sentences with "mae/oes/does", and identification sentences which obligatorily take the verb in second position ("Gareth dw i"). These distinctions are quite puzzling, and I think it would be good with lessons dedicated to them. Pob lwc gyda'r ymweliad i Gymru. Llai o eirfa Saesneg ddi-angen! Mae geirfa'r Gymraeg yn helaeth ac yn hyblyg iawn, ac mae wastad gair Cymraeg lle bo gair Saesneg. Pam tlodi'r iaith trwy ddefnyddio cymaint o Saesneg? Mae'n fwy pwysig gwyned yn siŵr bod pobl yn dysgu'r eirfa fwyaf gyffredinol yn hytrach na eiriau sy'n 'fwy pur' sy ella yn allan o ddefnydd. Dydy ieithoedd ddim yn tlodi maent yn datblygu ac yn benthyg. It is more important to make sure that people learn the most common vocabulary as opposed to "purer" words that might be out of use. Languages do not become impoverished they develop and borrow. Clepyn makes a valid point, so do you Ellis. I think a unit on the 'common' and 'pure' would be of interest and importance to learners. Poppy ping is 'fun' but learners may like the option of learning microdon, or peirianydd instead of mecanic for example. Rasio, beicio, stiwio, copio, stemio and sgipio...these are Welsh words I have been exposed to in Memrise vocab? The issue with Clepyn's post wasn't the suggestion to include/teach more traditional words, it was that they proposed it in a manner that devalued words which are common occurances within the language simply because they are from English (we would not look down on the word "Survive" from French simply because it come from another language), especially the language of the younger generation, which (even though it is practically tradition for people to complain about how the youth speak the language which ever language it maybe) is in no way supportive of the survival of the Welsh language. The issue with teaching many (even a couple) different word for one english word unneccesarily can confuse people. For example we could teach "Yr ydw i", "Yr wyf fi", "Rwyf fi", "Rydw i" and "Dw i" for "I am". These are all correct forms in Welsh though the first two are (very) old fashioned therefore there is little point teaching them in a course designed for beginners where we have limited time and space. (Sorry not the best example since we are talking about English words though it does demonstrate how teaching multiple forms can be confusing for learners. Okay, I see your point. In a similar vein, a liberating concept for me as an awkward learner was when I was told to not get so caught up and 'stuck' with mutational perfection, something that brought multiple abrupt halts to learning process. The key here is obviously not to discourage the new learner so that the 'purity' can follow after the 'hook.' Thanks for the explanation. We need to be careful with words - there may well be words around that we could teach, but if they are not in common use then many Welsh speakers may be unaware of them! We can definitely try and avoid slang words and expressions where there is a 'better' and commonly used word or pattern, though. Similarly we need to be careful with dialect forms - some of these are very commonly used in particular areas but sometimes not widely understood elsewhere. Firstly thanks for all your hard work to date. My Welsh was disappearing from my memory, before duolingo. Living abroad, I had no easy, fun way to try and maintain or improve it. I think the idea of either extending or having a second tree appear after you complete the first is a good one, but would worry that if your tree appeared to be twice as long as any other language from the start, it may put some people off. I have completed a couple of trees and was driven towards the end by an ambition to finish. The french tree gave a celebration at the end and made me feel pleased. I was then left looking around for what to do next and repeating the same exercises over and over seemed to have left me in limbo I would have been delighted at this point to be offered a follow on tree. Fed up of repeating the same I then went back in as a French speaker to learn English. although the course was much the same it challenged me in different ways. When I reached the end of the tree no jingle a bit flat really. Now I am learning Spanish as a French speaker and find my french spelling is tested on almost every exercise much more emphasis on conjugations and masculine and feminine than when i did the English tree. A second Welsh tree could maybe achieve the same thing and not leave people in limbo when they come to the end. I agree with the person who suggests the word pairing exercise. In the other languages they have an option to buy bonus content using the xp points that you earn The ones I have done have been very poor covering flirting and idioms. However if you could offer bonus skills one on Rugby terms, the other maybe on poble y cwm it would help us watch the two most popular programs on S4C. Mutations are frustrating and must be a nightmare for those with no school education in them. I think it would be a mistake to hide them away until the end of the course. Is there anyway that drop down boxes could be incorporated as a reminder when needed. I'm learning Welsh from scratch on Duolingo and actually I find mutations very enjoyable and intuitive. That said I think the "hover info" on words can really be improved. Just marking words with their gender, mutation and number would be incredibly useful. Rownd a Rownd as well as Pobl y Cwm - which I don't watch! What are Bonus Skills and how do you access them? If/when they are brought out for Welsh, can you have some kind of 'Read this first' intro avalable on apps as well as ordinary platforms? I didn't find that tips and notes existed until I had finished the Welsh tree and I can see it would have been a lot easier if I had! p.s. Sorry I am only interested in Welsh as I am no longer fit for travel! A couple thoughts so far. I agree with others about the annoyance of working on location names in the abstract, but I can also see how it could become a very, very cool section. Use the picture-type exercises here - connect the locations to maps, to pictures of attractions in the towns or of things the towns are famous for, etc. Or give sentences that help build those connections. Use it as a window into not just the dual names but a teaser about the places. As for the frustration of dialects... is there any way to repurpose the 10-word pair-matching cloud kinds of questions that other languages use to help connect constructions from one dialect together and separate them from constructions from another dialect? Or, alternatively, to use them to connect words that mean the same thing in different dialects? I second the wishes for getting a better sense of the verb constructions (affirmative/negative/interrogative, 1st/2nd/3rd singular and plural, etc.) earlier. It's feels constantly like there's this big mystery coming up and I'm not sure if I'm going to have to unlearn a lot of things. Ditto plurals, mutation, etc. More about the genders of words? I like this suggestion. Perhaps there could be a gender marker in the word hint. An example of when someone hovers over the word "Welsh" in the English sentence, the Welsh translation can pop up as "Cymraeg (f)" or something like that. The course is great - I have used it for revision of the skills i have learnt on cwrs mynediad and sylfaen. The grammar explanations are really helpful too. I quite like the single words! Diolch yn fawr iawn a chi. Totally agree!! The course is so much more accessible than anything I have done before. You can do 5 minutes here and 5 there. Brilliant if you don't have a lot of spare time to go to classes etc.. Single words are OK in some situations but with bad sound in revision exercises with no idea of context, 'type what you hear' is very, very annoying! I am not nearly finished with the tree, going slowly but steadily through all the skills. I really like the course so far and hope to reach the end of the (refurbished) tree one day. I like the built up of the course, the length of the units and especially the very comprehensive Tips and Notes. There is one unit I would like to see adapted. That is 'Possession'. I think the 2 lesson unit is far too small for the amount of information it tries to teach. It also doesn't help that half of questions asked in the lessons are unrelated to possession, also there are too few questions asking me to form a welsh sentence containing a form of possession. I checked the lessons (it could be that there are also hearing exercises, I shut them off for now): The first lesson has 7 questions unrelated to possession. It asks to translate 'gath ddu' and such. Then 3 questions are welsh to english translations describing possessions. The second lesson has 1 unrelated question, and 6 welsh to english translations. So, within these lessons i'm not taught how to make my own welsh sentences describing possessions. When i do 'strengthen' for specifically this unit i only get a few and have to work my way through a whole lot of 'gath ddu', 'y draig' en 'car' to get there. Point being, I would like to have more english to welsh translation exercises and a lot less clutter of unrelated short vocab in the unit 'possession'. And maybe another lesson. One to learn to work with gyda and the simplest form of gen i. One for the more advanced forms of using gan. And another for questions and negatives. Maybe. Thanks for all your work! It's great. A separate skill for Yes and for No. Or a more advanced skill farther along the course. That's an excellent idea, there is a whole separate course taught in Wales called Cymraeg i'r Teulu which might be useful to add in somewhere. Some of the elements of this are in the main Mynediad/Sylfaen/Canolradd coursebooks as extra units. Well, I just started the Welsh course and I must say, I have wanted to start it for a while but I thought it would be too hard. See I am doing the Irish course and it has been made entirely too hard. I think this is something to consider when you are updating. People who have been through the course may want more but the thing I like the most about it is that there aren't LOTS of lessons for each section and there aren't tons of words for each section. I can't do 10 lessons full of words and then review them and know ANY of them (one lesson on another language tree I am doing has 10 lessons and 47 words). It just isn't possible. So if you are going to add to it, my suggestion is that you remember the people doing this are mostly beginners so don't over do it and add LOTS of words per section. I am looking forward to working on the Welsh tree and am please with all these words that I get to hear and know the pronunciation of! Nice course so far. Yes, the irish course is difficult and our approach has been different. I definitely agree with you about having short, punchy lessons and that's something we are hoping to continue with. At present our course is a bit variable and sometimes there will be longer lessons, but we're hoping to improve this. The topic might be a bit too large for a single module to cover comprehensively, but we can certainly look at including some basic phrases. Take a look at the 'Gofalu trwy'r Gymraeg' smart-phone app - that covers using Welsh in a wide range of caring professions. It has been put together by Swansea University and Coleg Cymraeg Cenedlaethol. Could we get more names for people as well as more place names? I don't know how hard it is to mix those in, but I'd like to learn to say/spell more traditional Welsh names, and while I'm sure the Lingos are very nice people, it'd be nice to hear about others. As a North American that hasn't had the opportunity to go to Wales yet, the place names are extremely difficult. I second moving it further down the tree. I also get tripped up with past participles like got vs gotten. In North America, we still use a lot of older form past participles like gotten, drunken, etc. They seem to be consistently marked wrong. It's not a huge deal, but it can be a little frustrating. Maybe move the math terms further down as well? Elementary students might find vocabulary for division problems useful, but I am not so sure about beginner adults. Over all you have done an awesome job, and I look forward to your improvements. Your work is much appreciated. I'm enjoying the course and am learning Welsh from scratch. These are the things that I would find helpful. Can the sections which involves the different dialects introduce the usages separately? So, for example, you would have Possession split into Possession SW and Possession NW. Once we are familiar with them then I'm fine about being expected to understand both forms and having them mixed up within the same element. It's just very confusing as it is. In the Dialects section I couldn't work out which words belonged to which part of Wales. Also please can words be introduced in their unmutated form. In the Opinions section, for example, it would help in understanding how mutation works if they were introduced individually unmutated and then used in descriptive sentences with the mutation. I look forward to the extended tree when it is available. First let me say THANK YOU for creating this course! I've been trying to learn Welsh for years with zero luck. Staring at a book just doesn't work for me. That said, I'm also learning Spanish and enjoy the variety of exercises that has... Maybe they are in the Welsh and I haven't gotten there yet, but I like the matching of words that the Spanish has (it's like a block of words randomized in Spanish and English, and you match them)... it's just nice to build your vocabulary and test the words you know, plus work on the ones you don't. Plus the variety is nice, not just looking at sentences constantly. I also agree with another comment on this thread, sentences are better than single words. I'm excited to continue the course and looking forward to the changes! I did not read every single response so sorry if this is a repeat... In many ways I did like learning mynd, dod, cael, gwneud separately, but I now find that I get them mixed up. Maybe there could be another skill shortly after that quizes on them all together? I am not sure if that is the best way to handle it, but that is what comes to mind. I think once you get past the first few skills you don't need to be quized on single words anymore. Using them in a sentence is good vocabulary practice. And it is a pet peeve of mine that some of the grammar practice is 4/5 single word vocab. I saw someone mentioned the first few lessons focused on draig. I loved that. It is what initially hooked me. After reading all the technical requests for additions and improvements may I add a very simple one. What are the names of the letters of the Welsh alphabet? I know that 's' is ess as in English and 'c' is ec from S4C but what about 'rh' and 'll' and 'ngh' and all the other letters. The Welsh alphabet is set out in the notes to the section on 'The' in Tree1 (the twelfth section, or thereabouts). We will add the names of the letters shortly. Thank you for the reminder. As a new learner in South Wales it would be helpful to be able to exclude or mark the North Walian variations (and possibly vice versa) - it can get very confusing as a beginner! Well, it is a more complicated situation than just 'north' and 'south' - see the notes for the section on 'Dialects'. This course actually covers very few dialect variations, but we do try and cover those that are commonly found in the media as seen and heard all over Wales. Where there are differences between the 4-5 main dialects we do try and explain those in the various hints and tips. You will need to use a web browser to access Duolingo to see the hints and tips at the moment, but they are formatted for easy viewing on mobile devices as well as on computers. We may perhaps reorganise some sections of the course in tree 2 so that particular sets of variations are kept within lessons. In a given section one lesson might cover variants from one area while the next couple of lessons might cover variants from other areas. We are still thinking how best to address this sort of thing. I would also prefer to be taught one dialect, just to be able to speak the language and formulate correct sentences and concepts, before introducing different ways of saying the same thing or different versions of words because it's been befuddling me as well. I would agree to put dialects further along in the course. I'd like to have questions where you're tested on your pronunciation like you are in German. When is Tree 2 coming out? Months rather than weeks. It is difficult to do with more than a small team due to the coordination needed, and of course it is a matter of finding the time to do it. At the moment our priorities are to take out the few remaining errors or oddities in both English and Welsh that are difficult to remove from Tree1, extending the vocabulary in the existing units, and then adding in the additional patterns and extending the vocab to meet the needs of 'intermediate' Welsh. In the meantime, suggestions are always welcome! I would like to see more modules/exercises geared towards the language that is used regularly on Radio Cymru. For example on a Saturday when there is sport on, the phrases that are used are very repetitive. I think this would be an easy way of improving listening skills and it would also help to increase the listener figures for Radio Cymru worldwide. It would also be very rewarding for the learner to feel that they can listen to a Welsh language radio station and actually understand what is going on. I just got an upgrade on my phone for the hearts and gems. I don't understand the rules although I am trying to give it a try and figure it out. There is more stress regarding errors and you can't keep on working on your lessons if you make too may mistakes without paying. For the past few days I have worked mostly in the earlier lessons. Is there any way I can get it back to the lingots? Will tree 2 be like this? My 2 sisters and I are enjoying being a club. We've been studying for over a year now and were in Caerdydd a year ago. We plan to visit again going deeper into Wales, exploring our Welsh history. We plan to keep on studying. We have been looking for an audiobook of Charlie and the Factory to help with our studies. Memorise is great for some vocabulary but Duolingo is best for the sentences and the understanding behind the structure and nuances of the language. I will be working from my computer today and hoping the hearts and gems infection has not affected the learning. I have completed my tree but am not an ace so I continue to work on it. I now use Memorize, U-tube(Y Tri Mochyn Bach, stop action with the words below) Radio Cymru and James a'r Eirinen Wlanlog Enfawr. I am considering purchase of Bore Da in audiobooks along with the written work. For suggestions for the course. Adding a conversation one sentence at a time including the appropriate yes or no might be helpful. This could be the last lesson of the group of lessons. You could have us purchase conversations to send to our emails or keep available in Duo once purchased......just not these hearts, gems and treasure boxes. maybe you can do this: to learn a new word, just that word in a exercise, but then, use it in a sentence, when in practice, use only sentences. I think it would be good to have a finite tree going to a certain level and then have a second tree to go further. The trees seem to get longer so it would feel good to see an end in sight... mind you I've only been going for 453 days in total. 2 years since the initial post and we're still waiting for Tree 2. Oh well, here's my feedback as someone who's early into the tree. The biggest problem I have with this tree is that the same few sentences appear very often so I often end up memorising the answers. More variety with the problems would help. I thought when we got the newer longer version of the tree with levels for each skill, that was tree 2, this happened some time ago for me, this has also occurred for French and Spanish trees. I do not know of any language on Duo where there is an actual second tree, it's just that the original is improved.